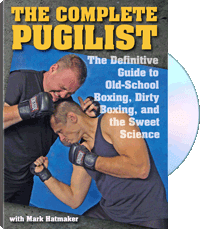 Paladin Press and best-selling author Mark Hatmaker bring you 10 hours of precise, detailed instruction in every major aspect of boxing from No-Holds-Barred fighting to the sweet science of today, giving you what you need to win in the cage, ring or octagon. Focusing first on the basics of footwork, ring generalship and body movement to keep your opponent from landing a punch, he then teaches the fundamentals of striking, from such basic punches as shovel hooks and the true cross to "illegal" shots like elbow strikes, foot stomps and hacksaws. From there, he shows you the most effective combinations and how to string them together to maintain an unbeatable offense and put your opponent on the canvas. In the lengthy trigger punching section, you learn how to best make use of body angling to turn your opponent's offense against him. Finally, Hatmaker teaches little-known strategies of clinching, feinting, infighting and more to ensure victory whether you're in the arena or on the street. If you're a boxer looking to hone his game, a beginning student seeking instruction in one of the oldest fighting sports known, or a practitioner of any martial art looking for a proven system of stand-up fighting for self-defense, this video production is tailor-made for you. For information purposes only.